Spring, Are You Playing With My Emotions Or Not? This is a sign that Spring is near. After setting the clock ahead one hour last night except the one by my bed, I woke up this morning at 9 AM only realizing about a half an hour later that it was really 10:30 AM. Talk about time flying by, right! Given that the weather here in Connecticut is pretty nice today, I decided to celebrate my extra sleep with a little walk around the yard and forest here on Glen Road. 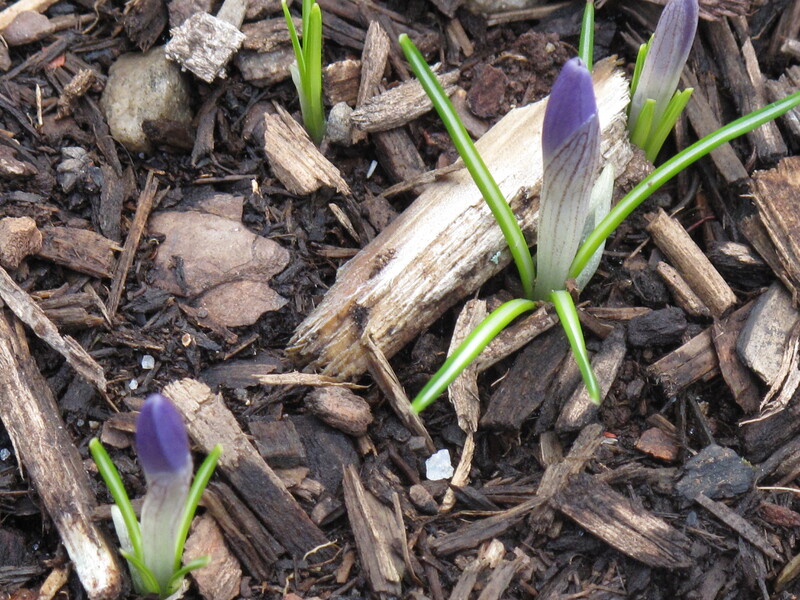 I quickly found these little crocus poking their heads up telling me that Winter is almost done. Said another way, Spring is near. This revelation made me more alert and I could see that life was starting throughout the garden and woods. Proof was there if you paid close attention. This Winter was very hard here on Glen Road. Record snow and more ice than I can ever remember. We bought a new snow blower at the beginning of Winter and decided that we could shovel and plow on our own now. Let’s save money and cancel out of our plowing service. Little did we know what we were signing up for with the record snowfall this year. The worst was when we had to plow and shovel thirty inches of snow that fell during the night. We also decided to do an addition over our garage during the Winter months which meant that we would need to park our cars outside for the Winter. Snow on a car is hard enough, but getting an inch of ice off a windshield is beyond crazy. The office I work in was closed five times this season due to the weather. I never remember our building being closed. This year’s Winter seemed to take a heavy emotional toll on all of us as well. When you don’t see the sun for most of the season and can’t leave the house due to the crazy conditions outside, it’s easy to get a little stir crazy. A little depressed, I guess. I am so happy that Spring is ready to arrive. I need to see the sun, the grass, leaves on trees, a tulip. Then I walk a little further and a rude reminder hits me smack in the face. SNOW!! You are still here. You could easily come back for one more visit, maybe more. Is Spring playing with my emotions? Is Spring teasing me or is Winter just being a bully? Spring needs to get here NOW. I need you to arrive. No little hints. JUST DO IT! I know that it could still snow again. I can’t take it. Sign me up for a straight jacket. I will go crazy if I see one more snowflake. How sick of winter are you? Amen to the sick of winter thoughts! I’m totally over it. 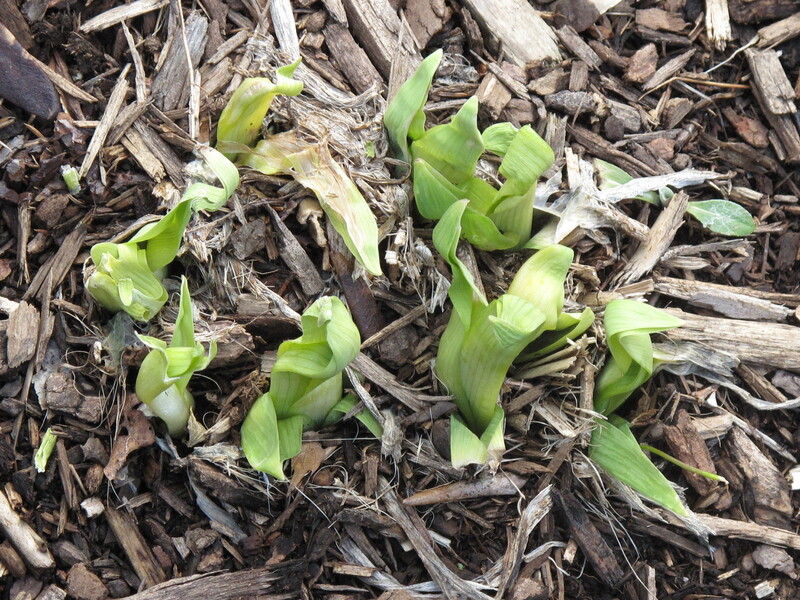 I’ve found my daffodils peeking through the winter mulch of leaves.. it gives me hope. Thanks for the comment Kenn. 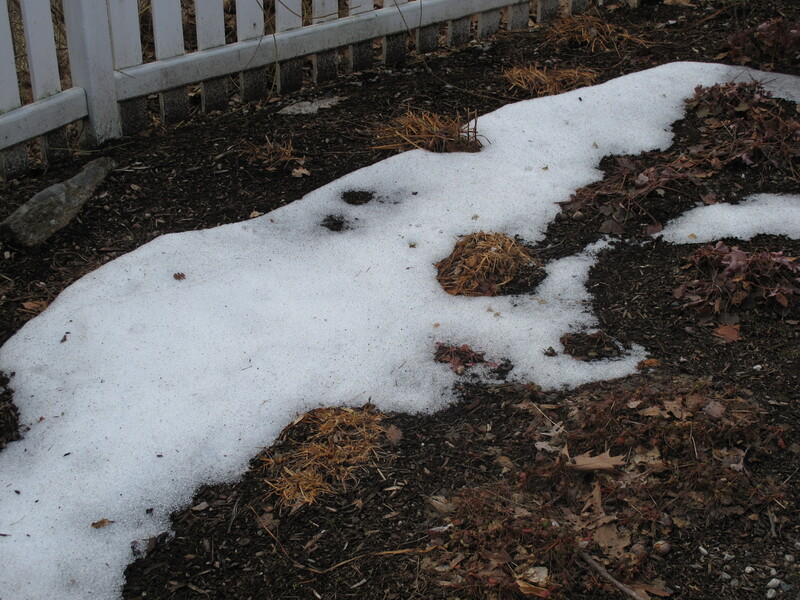 I don’t want hints….I want Spring to get here now. Fully, totally get here. If I see more snow, I am changing this blog name to “Acorns On The State Mental Hospital”. 🙂 Come back and visit us soon. With each passing day I get more and more excited with the thought of sixty and seventy degree days. After Snowpocolypse I think we all are. I am looking forward to shorts and flip flops. Thanks for the great comment FluteGirl. I love Snowpocolypse!! I am going to steal that one. 🙂 I just want to be hot (temperature wise). I am so sick of the cold. Enough already. Appreciate your support and come back again to Acorns On Glen. Just the sight of your very young flowers brought my spirts up. I haven’t seen a sign of spring where I live. And yes I am very fed up with winter and snow. I really think I should buy one of those “blue lights” they say will act like the sun, your brain thinks it’s the sun and you begin to feel better emotionally. One more week of winter and I am off buying it. Hi again Carolkin. It’s funny you mention those lights. We were just discussing here on Glen Road about where we could find one. Doctors say they work. If it doesn’t warm up soon, I may need to move to Florida during the winter (something I said I would never do). I can’t take it anymore. Come back and visit us soon here at Acorns On Glen.